Before we leave Madurai, I wanted to share a few photos from the streets and villages around the city. It’s an ancient city, perhaps 2,500 years old, and has been the site of a major Hindu temple for (quite literally) millennia. In many ways, though, it feels like a village trying to be a city. The streets are filled with trash, the traffic is chaotic, and livestock wander the streets and empty lots. Tourists are coming in greater numbers, though the infrastructure is not yet fully developed to support them. A brand-new airport now welcomes international flights, but there appear to be only a small number of tourist-quality hotels and restaurants. Still, the people are friendly and the Aravind medical facilities world-class, so there is huge potential here. 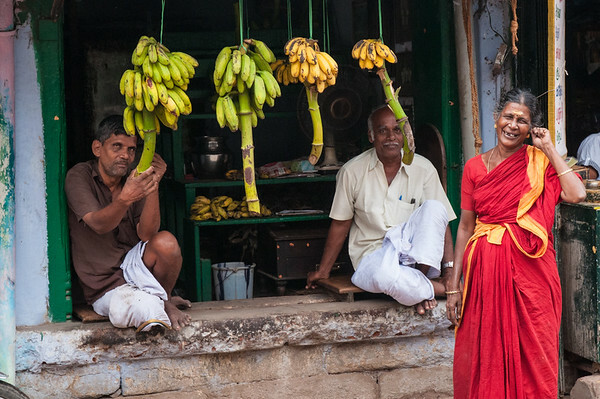 A woman shares a laugh with banana vendors. 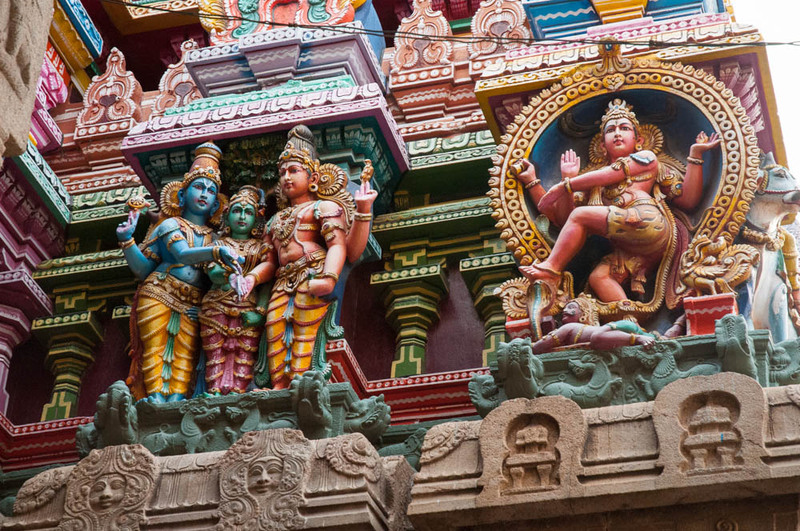 The highlight of any tourist visit to Madurai is an exploration of the Meenakshi Sundareswarar Temple, an astounding piece of 17th-century architecture and one of the largest Hindu temples in India. Quoting Wikipedia, the temple “is dedicated to Parvati who is known as Meenakshi and her consort, Shiva, named here as Sundareswarar. 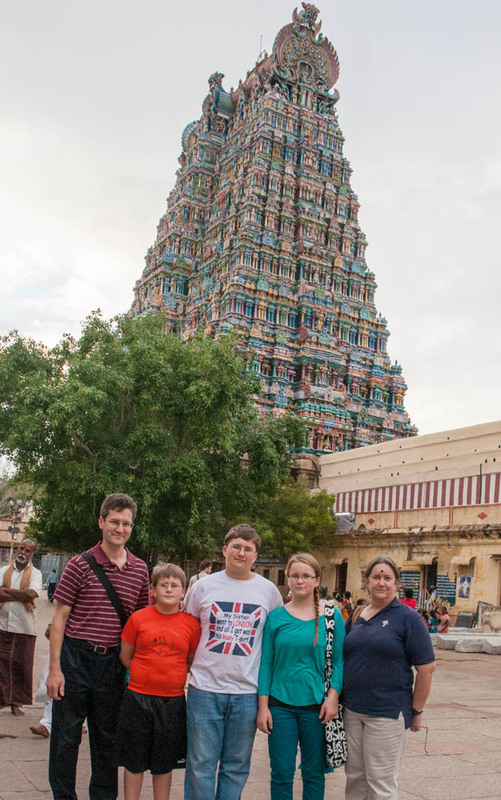 The temple forms the heart and lifeline of the 2500 year old city of Madurai. The complex houses 14 gateway towers called gopurams, ranging from 45-50m in height, the tallest being the southern tower, 51.9 metres (170 ft) high, and two golden sculptured vimana, the shrine over sanctum of the main deities. The temple is a significant symbol for the Tamil people, and has been mentioned since antiquity in Tamil literature, though the present structure is built during 1623 to 1655 CE.” The gopurams are astoundingly carved with thousands of figures, mostly gods and goddesses, all freshly painted in 2009. Detail on the West tower: at left, Vishnu, Parvati, and Shiva; at right, dancing Shiva. We toured most of the temple and I took some nice photos, but they really pale in comparison to my collection from my visit three years ago. On that muggy day in May 2009, I happened to visit the temple, totally coincidentally, on the biggest festival day of the year (Chithirai Thiruvizha). That day was truly one of the most fantastic experiences I’ve ever had in India; read the blog and check out the photo album. We visited on a Friday evening, which happens to be the most auspicious time for prayer, so the temple was very crowded with worshippers, families enjoying an evening out, and tourists. After checking our shoes with the shoe-keepers near the gate, and passing through airport-style security screening (most prominent historic and religious sites now include such screening, because they are attractive sites for terrorist attacks), we strolled through the temple’s many halls and courtyards. A tour guide spotted us (not hard, we’re readily obvious in this crowd) and offered to give us a guided tour. We’ve had mixed results with these sort of fellows, but he waived his government license at us and I engaged him in enough conversation about his services to be sure his English was reasonable. His guidance was helpful in navigating the complex temple grounds, and explaining the history and significance of various idols and sights. He offered to take us to a spot outside where we could get a rooftop view of the temple; I relished this opportunity because there is no other way to capture the grandeur of this immense place. When we arrived at the curio shop (of course!) I realized his true motivation for our visit. Yes, it had a rooftop observation platform, but to get there you had to climb through three levels of carvings, silk scarves, carpets, and the eager attendants insisting that you “just look” at their handicrafts. It is a routine we know well – the guide gets a kickback for bringing customers to the store – and we took a pass on the shopping. Select your style and color, then they make your shirt to order, on-site, within 2 hours. We had actually enjoyed shopping at purthu mandalbam, the “new market” on the other side of the temple. It was built a few hundred years ago by one of the kings, and was packed with tiny stalls selling cheap handicrafts, handmade housewares (like iron tava griddles), and votive materials. Fun place to photograph! There were rows of men sitting at foot-powered treadle-style sewing machines, most of them working busily at sewing garments. 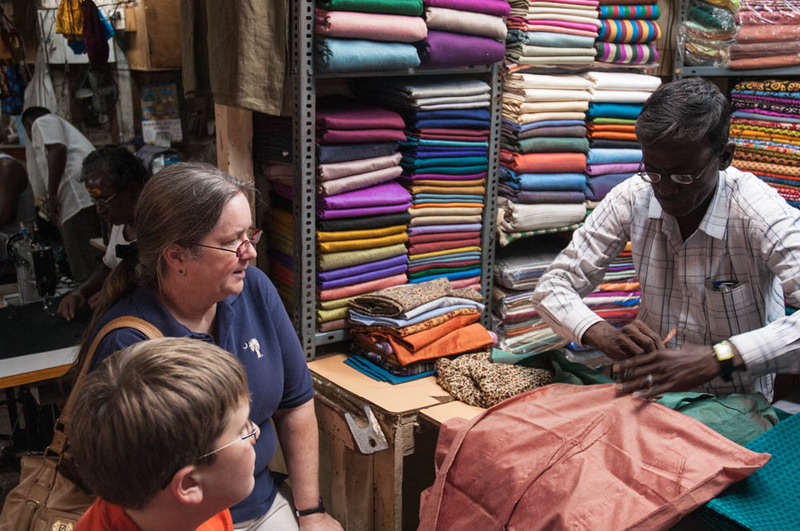 Pam found a stall selling silk shirts and kurtas – you select the style and fabric, they take your measurements, and come back two hours later to pick up your finished clothing, all fabricated on-site and on-demand by this army of sewing men. Soon I’ll post more photos from that shopping market and from the streets nearby – many photogenic views there. 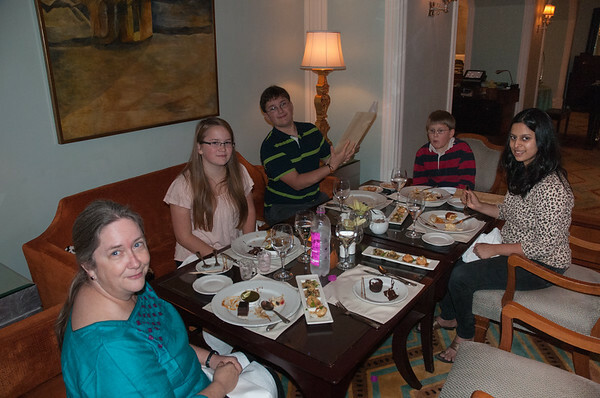 We dined at The Taj — a fancy name for a not-fancy place. At this point we were tired and hungry and dark was falling. I had scoped out some dining options nearby so we walked around the temple and down the street looking for one of the restaurants. The streets were busy, noisy, and dirty – Madurai is not nearly as well developed as Bangalore or Mumbai. Andy has been feeling ill so he was tired and cranky. 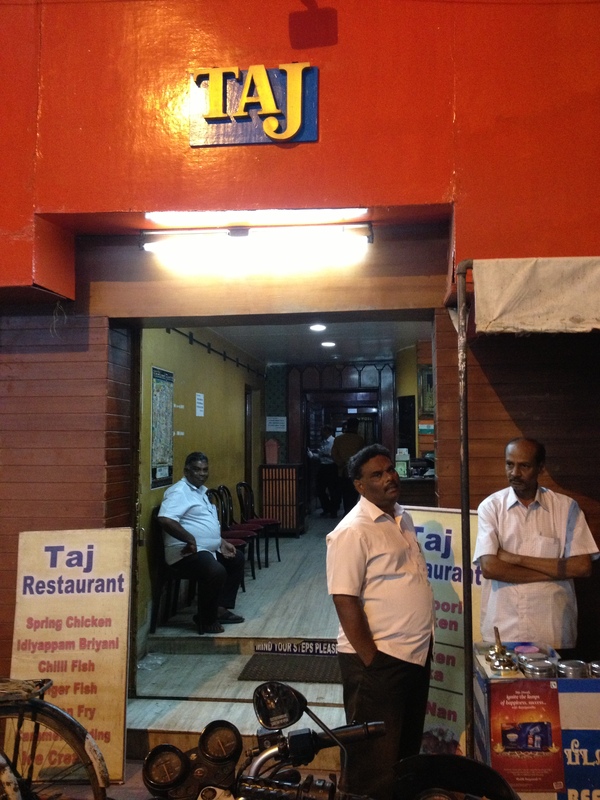 Finally we found the two places – neither looked particularly clean or inviting, but we ate at The Taj anyway. At least it was cheap. Although Christmas is just another business day for most of India, including Mumbai, you can’t miss the fact that it is Christmas season. 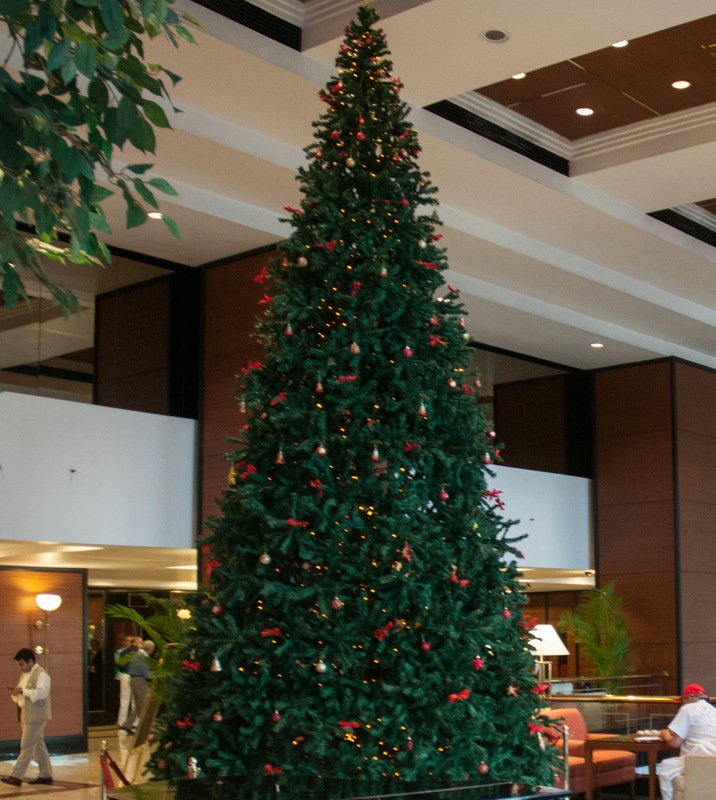 Every major hotel is decorated for Christmas, including an elaborate artificial tree. In our hotel, even the elevator music plays a collection of the instrumental seasonal music you might hear in a US shopping center. On our Jet Airways flights to Madurai, the cabin background music was a collection of instrumental favorites like Jingle Bells and Dashing through the Snow. Humming these snow-themed tunes, it was somewhat jarring to step off the plane to a humid 80-degree evening in Madurai, city of temples. We entered the sparkling new Madurai airport and were quickly surrounded by dozens of eager-looking middle-aged men, dressed sharply in their best white dhoti and pressed white shirts. What a welcoming party! But they were all looking past us, with great excitement and anticipation, held at bay by a dozen stern-looking local police officers. We made our way outside, encountering hundreds more men straining for a view of the VIP. There a row of fancy white cars awaited this man, whose photo we now saw plastered on posters and vehicles. Clearly a regional politician with many followers here in Madurai. Now it was well after dark, and a light rain began to fall. We were glad to find the driver (pre-arranged by Aravind Eye Hospital) to take us to the guest house. The ride was a bit harrowing, on dark narrow roads; many pedestrians and bicyclists were barely visible, and oncoming traffic taking great liberties with the center line. I’m sure glad I wasn’t driving. 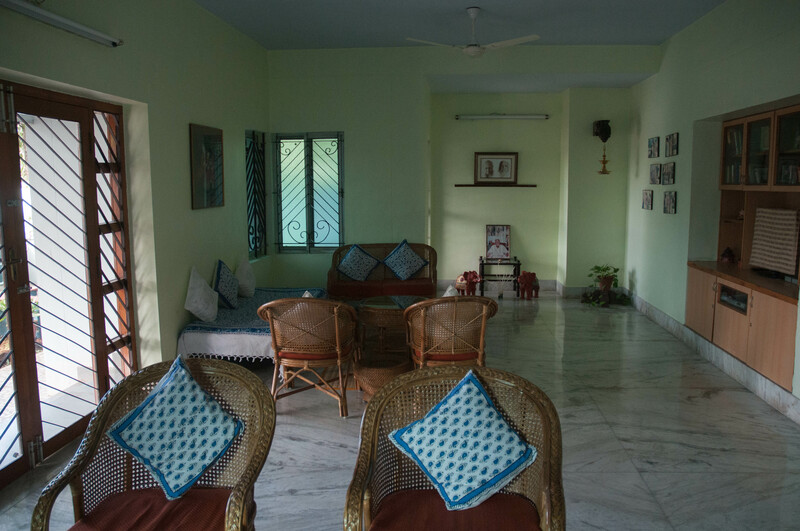 The guest house is a pleasant homey place, and cheerily tended by two women in pretty saris. The house has about 20 guest rooms, a nice common room, and a dining room where the ladies serve three home-cooked meals a day. The rooms are comfortable and air-conditioned; my only complaint was the road noise (problematic on the rooms at front) and a neighbor who likes to blare loud Bollywood classics starting before 6am. 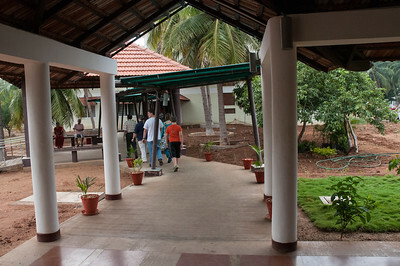 The Aravind Eye Hospital is one block walk down the street. A short walk, but you must dodge the cows and goats that wander around the neighborhood, and cross the street (yikes!) bustling with autorickshaws and two-wheelers that seem unaware of the presence of pedestrians. A woman at the free-service patient center, waiting checkup after surgery. We spent our first morning visiting the Aravind Eye Hospital, their training center (LAICO), their research building, and the Aurolab manufacturing facility. The origin and history of this organization is fascinating and inspiring – I highly recommend watching the video Infinite Vision, which tells the story of Dr. V and his mission to eradicate needless blindness in the world. 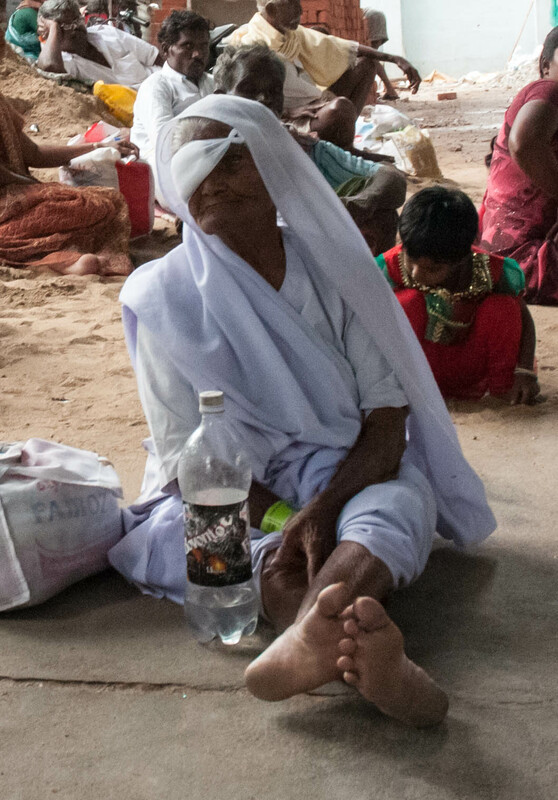 The Aravind system now conducts thousands of eye surgeries every month, with better outcomes results than in the developing world, and with their services completely free to those who cannot pay. (Indeed, its quality and its teaching are world-renowned: at the guest house we met a medical resident from Johns Hopkins University who was spending a month training on surgical technique here at Aravind.) I’ve posted a few photos on SmugMug, but my blog from my May 2009 visit has a wider variety. Andy wasn’t feeling well so we took it easy in the afternoon. Pam and Mara and I went to tour the Gandhi Museum, a nice place with a well-presented history of European involvement in India and the independence movement, of Gandhi’s life, and of a small collection of Gandhi-related relics. 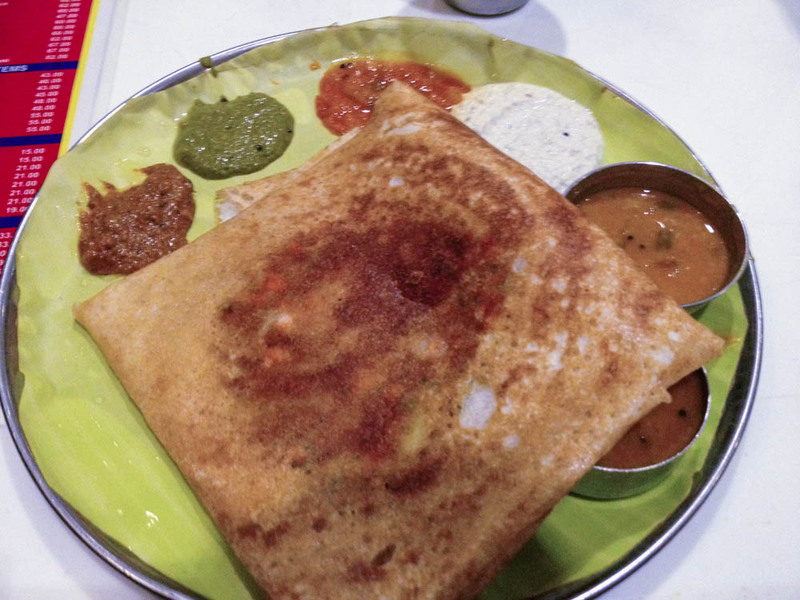 We dined at Sri Sabareesh, with excellent South-Indian food like dosa and idly. We rode in two autos (autorickshaws) there and back – gone are the days when all five of us could fit into one auto! It’s quite a wild ride; our driver moved fast, weaving in and out of traffic and honking at anything in his way. The streets are crowded, dirty, and rough – in many ways Madurai feels like an overgrown village that hasn’t managed its growth into a busy city. Tomorrow we visit a new Aravind outpost – LiveWell rehabilitation facility – and the biggest and most amazing Hindu temple in south India. Merry Christmas! We’re used to spending Christmas away from home – we always celebrate Christmas with family in South Carolina. [Well, every year except when we were living in Bangalore; there, we celebrated with my parents in our IISc apartment.] But this year was the first time we’ve ever been in a hotel for Christmas, and the first time our kids have had Christmas away from the rest of the family. Furthermore, we had already exchanged gifts back home in NH. So, Christmas Day was necessarily muted. Now we’re off to Madurai, in southern India, for a visit to its historic temples and inspirational Aravind Eye Hospital. On Christmas Eve we attended High Tea at the Taj Mahal Palace Hotel, on the waterfront in South Mumbai. Built in 1903, even before the adjacent Gateway of India, the Taj is the original home and flagship hotel of the Taj group, which now has luxury hotels around the world. We were joined by our friend Kirti, recent Dartmouth grad and Mumbai resident, for this lovely meal. It was worthwhile visiting for tea just to explore the grandness of its lobby and interior architecture, though as non-guests we were able to visit only a portion of the hotel. We passed a display of photos highlighting famous visitors to the Taj, over the century, including queens and rock stars and cricket players, and most recently, Barack Obama. In the display is a guestbook open to the page on which Obama signed a note. I have a few photos in my Mumbai album. High Tea is served late every afternoon, in the informal and peaceful Sea Lounge overlooking the harbor. While a pianist played Christmas tunes, we explored the buffet and its delicious range of savory and sweet snacks. The waiter brought petit fours, scones, tiny sandwiches, and other tea-time standards. My favorite were the flights of chaat… my favorite was the sev puri but I loved the bhel puri and liked the dahi puri. The kids were entranced by the chocolate fountain, quite literally a chocolate fondue waterfall in which they could dip fruit sticks. And, of course, each of us received a pot of tea selected from over a dozen varieties. Magnificent! 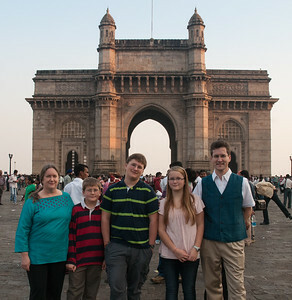 We arrived just before sunset, allowing a fine opportunity for a family photo in front of the Gateway of India. The top tourist attraction in town, this arch was built in 1911 to commemorate the visit of King George and Queen Mary. Hundreds of other people were visiting, all passing through metal detectors and bag checks before being allowed into the plaza. The arch and its plaza are beautiful, though marred by the ugly police fences strung around the perimeter. The security is necessary, given the 2008 attacks; I just hope a more permanent (and more attractive and effective) perimeter fence is in the works. Visiting the Gateway, the Taj hotel, CST station, and staying at the Trident, it’s impossible to forget the sad November day in 2008 when Pakistani terrorists attacked Mumbai. Known since as 26/11, these attacks began as my parents landed in Delhi for their tour of India, and while we were living in Bangalore. A terrible tragedy with 164 killed and over 300 injured, this incident shook India deeply. I wrote about it in my blog a few days afterward. Four years later, Indo-Pakistani relations are still strained. Indeed, as I write today, Christmas Day, the Pakistani cricket team is visiting India for the first time since 26/11, playing the Indian cricket team at a match in Bangalore. Let’s hope this is the beginning of an ongoing peaceful relationship. Merry Christmas and a best wishes for a peaceful New Year. I’ve posted photos from our first three days in Mumbai. Sunday was a quiet day so we took a walk around South Mumbai. Heading north from our hotel we walked past the Oval Maidan – a large park with at least a dozen concurrent cricket matches underway – snapped photos of the High Court and Mumbai University buildings, and down MG Road to the Prince of Wales Museum. This part of the city is full of grand Victorian-era buildings that blend European, Islamic, and Hindu architecture. Pam shopped at another FabIndia outlet, and we stopped to look at many street-side vendors. CST, the central railway station, formerly known as Victoria Terminal, is a grand site to see. Over 3 million passengers pass through daily. Mara, John, and Andy awaiting lunch at Mahesh Lunch Home. Perhaps a highlight of the day was our lunch at Mahesh Lunch Home, one of the most famous seafood restaurants in the city. Located incongruously on a dirty and dingy back street, the restaurant is sharply decorated in a modern style. 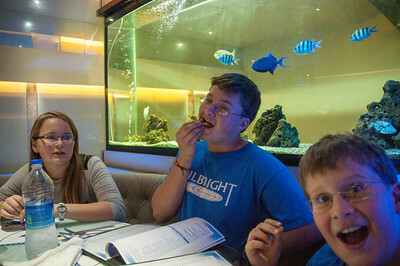 We were seated next to the fish tank, and enjoyed delicacies like prawn gassi and tandoori crab.